Due to the recent popularity of TV programs on cooking and dining, people's interest towards food and beverages has significantly increased. This article examines food and beverage trends this year. A monochrome food color palette is a relatively new concept that has been appearing in a variety of restaurants. Swedish cider brand Rekorderlig teamed up with Food By Color founder Ani Tzenkova to host a mid-summer dinner taking guests on a journey through a monochromatic food palette. Food photographer Isabella Vacchi presents her FoodTone series, which consists of capturing a themed dish and including its color palette and CMYK color range as if the styled dish were to be printed out. French art director Emilie Guelpa created a monochrome series for Fricote Magazine introducing the theme "one chef, one color." Other artists and chefs have come together to create series such as the Griottes pantone arts or Sabine Scheer's jell-o color series. Plating often distinguishes chefs and restaurants from others. A new form of artistic food presentation by color merges the art and culinary worlds. London-based gallery restaurant, Sketch, has undergone another art collaboration and renovation since its last makeover in 2012. This multi-restaurant complex consists of The Gallery, The Parlour, The Lecture Room and Library, The Glade and The East Bar. 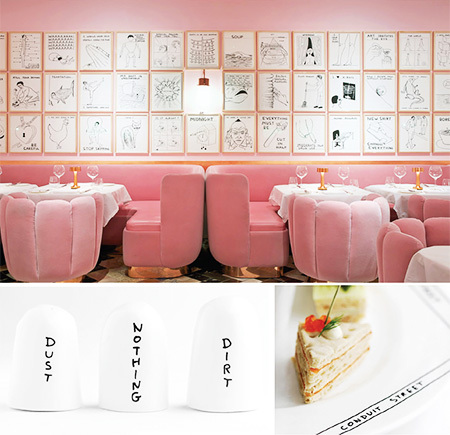 This time around, artist David Shrigley was summoned to sketch the walls of the powder pink dining room with 239 signature sketches. Interior designer India Mahdavi fused the concepts of Hollywood and Malibu Barbie dream house. This unexpected color is offset by the restaurant's original parquet floor which was intended to add calm to the tea café. Also featured at the site are Shrigley's custom-designed dining ware, and cute salt and pepper shakers. Sketch is a destination for food, art and music realized by Mourad "Momo" Mazouz and his team. Restaurant owners and interior designers are thinking beyond the obvious, to make their entertainment space striking. Instead of being influenced by art, actual artists are hired to collaborate on-site. 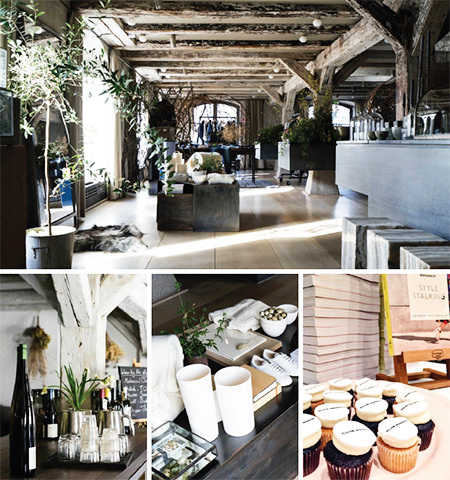 Club Monaco opened up a pop-up store in René Redzepi's Noma restaurant in Copenhagen. The space inside Noma that Club Monaco occupies is graced with wooden beams, Danish furniture, rustic greenery and a selection from Club Monaco's latest collection. The minimalist design of Club Monaco's collection perfectly matches with the Michelin-star restaurant. Whereas we've seen coffee shops, restaurants, and salons enter retail stores, we haven't seen the opposite ― bringing in a well-known retailer into a restaurant. Bringing together these two creates an entirely new dining experience. The concept of combining fashion and food is something we hope to see more of. Outstanding in the Field is a farm-to-table tour company owned by Jim Denevan who devised it back in 1999. It has organized over 700 dinners in 47 states and nine countries. Their mission is to "re-connect diners to the land and the origins of their food, and to honor the local farmers and food artisans who cultivate it." 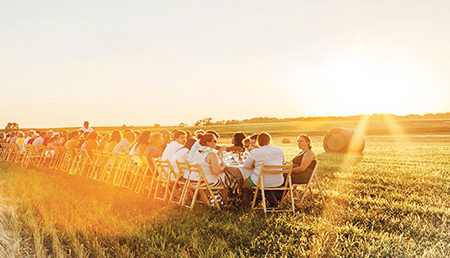 The team of seven travels, mainly around the United States, bringing together their cooking talents with local farmers and their produce, making the most of the land and eating outside in nature. Attending the event at the Queens County Farm Museum, I discovered that it was not only a great way to meet new people and eat delicious meals, but also an opportunity to appreciate the food and where it came from. The tickets starting at $180 per person are not cheap but it's certainly a unique opportunity. Each event invites 140 people on average. The atmosphere is relaxed and welcoming. At the reception you are greeted with appetizers and a complimentary drink, from a specific vineyard or brewery. Another unique brand is Brooklyn Grange, the "leading rooftop farming and intensive green roofing business in the U.S."
Situated in Brooklyn's Navy Yard, the farm was created in 2010 and now they grow over 50,000 lbs of organically cultivated produce each year. Spread over just two acres of rooftops, they're now expanding to egg-laying hens and honey bees. 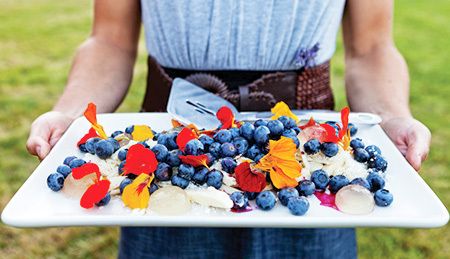 Brooklyn Grange Farm believes "that food should taste fresh. Because at the end of the day, it's about sitting down with our family, admiring that sunset over the city skyline, snacking on a perfectly ripe, sweet tomato and remembering: this is what real food is."